Located on seven spacious acres on the east side of Frisco, Shades of Green is a full-service, family owned & operated garden center. We offer advice, landscape design & installation by certified professionals, and a large selection of flowers, shrubs, trees, succulents, houseplants, and more. We specialize in native perennials that thrive in the often harsh conditions of Collin County and North Texas. Established in 1977 by native Texans, we’ve been proud to call Frisco home for over 20 years. We invite you to stop by and discover for yourself why so many consider us the best place to buy plants. If you have a question, please contact us. We’ve learned a lot over the years and are more than happy to help. We’re from here. That’s why we know what grows best here. Shades of Green is founded in by childhood friends Jeff McCauley and Rob Wier. Originally from Dallas, the two attend Texas A&M where they earn degrees in horticulture. Needing extra money for college, they begin mowing lawns around town. By the time they graduate, they have the third largest landscape company in Bryan / College Station. Upon graduation, Jeff and Rob return home to Dallas. Their first big break comes on New Year’s Day 1979 when an ice storm wreaks havoc on local trees. Wielding chainsaws, they begin pruning and trimming trees all over the metroplex. That leads to more landscaping work and firmly establishes Shades of Green in Dallas. 1981 – Shades of Green, Inc. In 1981 Shades of Green merges with another landscape business owned by John Marron and officially incorporates. The new partnership begins growing plants in addition to maintaining lawns and landscapes for residential and commercial clients. Shades of Green adds irrigation to its list of services, concentrating on commercial accounts and larger residences. There’s enough work to warrant five full-time crews with tractors, trucks, trailers, and equipment. The company sets up shop on a piece of land in southwest Dallas off of Loop 12 and Singleton in order to better serve the whole metroplex. Clients range from Fort Worth to McKinney. In the mid-80’s Shades of Green planted the large Red Oaks and Deodor Cedar that are in the square around the old Courthouse in McKinney. The collapse of the local economy brings commercial business to a halt and the company almost folds. Staff is laid off and all assets are sold. Partner John Marron departs amicably to pursue other interests. After a decade in business, Jeff and Rob are a lone duo once again. They persevere and succeed in turning things around by the end of 1988. Shades of Green leases property on Highway 380 just east of Custer Road to open a garden center that serves as the base of operations for the landscaping business. After surviving a snow storm, the Grand Opening is held in March 1989. The slogan, “Not Your Ordinary Nursery” is coined. Shades of Green acquires property in Collinsville to start a tree farm. Not long after the first planting, a brushfire destroys all the trees. The land goes largely unattended until 2000. When the landlord of the McKinney property opts not to renew Shades of Green’s lease, the company is forced to move their fledgling nursery. They relocate to the northeast corner of Lebanon and Preston Road and set up shop in the large yellow Quonset-style barn left by another nursery that had occupied the property years earlier. The decision is made to cease lawn maintenance/mowing operations and focus on developing a thriving retail nursery and landscaping business. Shades of Green experiences steady growth from 1994-1998 thanks to its location on Preston Road. But as Frisco’s population increases, so does the rent. After months of searching, Jeff and Rob find the Coit Road farmstead of Mary Standerfer Griffin, whose family has occupied the land for over a hundred years. Coit is a white gravel road at the time and the farmhouse and land are outside the city limits. After almost a year of preparation, the new location officially opens in December 1999. 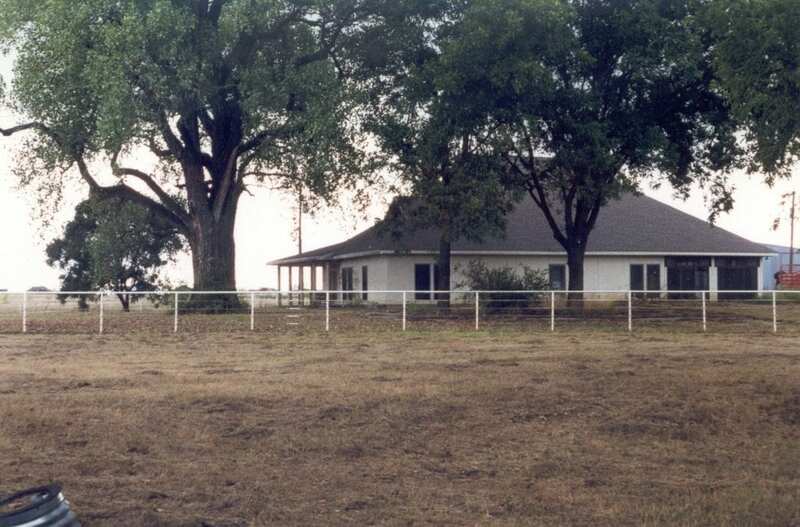 The Standerfer farmhouse that became Shades of Green’s home in 1999. Brice Creelman joins the company and takes over operations at the Collinsville tree farm, now named Brillo Verde. In addition to trees, he begins cultivating the native Texas perennials that become a Shades of Green hallmark. After 37 years with Shades of Green, co-founder Rob Wier retires and moves to the Texas Hill Country where he remains active in horticulture to this day. Co-founder Jeff McCauley assumes ownership and still designs landscapes for clients all over Collin County. The family owned and operated aspect of Shades of Green enters its 2nd generation in 2015 when Jeff McCauley’s son-in-law, Jarratt Calvert, joins the company as the new Operations Manager. Two years later, his wife Rebecca (Jeff’s daughter) joins him to serve as Office Manager. 2019 marks a milestone for Shades of Green as we celebrate 42 years in business, 25 years in Frisco, and 20 years at our current location on Coit Road.